· Micro-engine without core for aircraft helicopter model and a variety of electric drive products. · * SODIAL is a registered trademark. Only the authorized SODIAL seller can sell SODIAL products. Our products will enhance your experience of unparalleled inspiration. 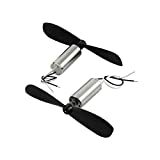 SODIAL (R) 2pcs Micro-core 40000RPM DC3.7V Quadcopter RC Motor with 2-Blade Fan/Product Name: DC Non-core Motor Rated Voltage: 3.7V DC; Non-Load Current: 100 MacLoad Current: 1.6A; Speed: 40000RPM; Shaft Size: 1 x 7mm / 0.04 x 0.27 (D. L *) Body Size: 7 x 16mm / 0.27 0,63 (D * H); Propeller size: 46 x 9mm / 1.8 x 0.35 (L * W); Cable Length: 50mm / 2.0 Main Color: Silver Tone Main Material: MetalNet Weight: 6g; Package Content: 2 x DC Core Motor Note: Light shooting and different display can make the color of the image element a little different from the real object. The error of measurement allowed is + / - 1-3 cm.